Getting to Chile—a narrow strip of land that sits between the Andes mountains to the East and the Pacific ocean to the West—is not quick, direct or easy. But even after three flights and a four-hour drive, I found myself in front of a mountain vista that took my breath away. I knew in that moment that the magnificence of this natural beauty was worth every bit of the journey. 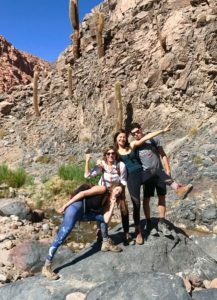 Exploring nature in Chile would not only be fun for my family and me, but also good for our emotional (and physical) health. A number of studies in recent years have shown that time in nature can have a significant impact on mood, increasing happiness and reducing levels of anxiety and stress, among other benefits. We may have taken a trip to Chile, but nature is accessible right outside your front door. Outings to local parks, daily walks, hikes in the woods, strolls on the beach—you don’t have to go far to reap its benefits. Our journey abroad would be my own personal experiment—what would nine days in Chile’s mountains and desert with my husband and three kids do to my mood? The view from the Tierra Patagonia hotel. Stretching across Argentina and Chile at the southern end of South America, Patagonia is a nature-lover and adventure-seeker’s dream comes true. 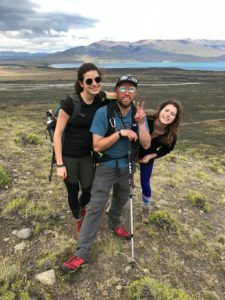 Traveling in December (summertime in Chile), our family settled in to the Tierra Patagonia hotel, which sits on the edge of Lake Sarmiento and looks out at the snow covered mountains of the Torres del Paine National Park. The hotel’s modern, sleek architecture uses natural materials—including local wood from a sustainable forest—blend it in to the surrounding landscape. After meeting with the head guides upon our arrival, we planned out a loose schedule of activities that would include a half-day hike called “Cornisas” on our first day, mountain biking, horseback riding, and our most challenging hike—a 13.5-mile climb up to the base of the iconic three towers (las tres torres), and one of the reasons many make this trek. 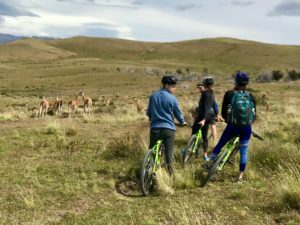 Biking through a herd of guanacos. In addition to the mountains, lakes and glaciers of Patagonia, there’s also plenty of wildlife to see. From the top of a ridge, we watched three condors sail across the blue sky. We rode our bikes through a herd of guanacos, a close relative of the lama, caught sight of two baby foxes waiting for their mother to return with food, watched a couple of ostrich-like rheas playing (or was it flirting? ), and drove past hundreds of sheep. Through it all, we were guided by Ignacio—nicknamed Nacho—who was altogether experienced and well prepared to answer all of our questions, supportive and encouraging during the more challenging bits, and easygoing with a great sense of humor that kept our kids, and us, joking for miles at a stretch. When it was our day to climb to the base of las torres, we woke up early and drove an hour into the park, equipped with a boxed lunch from the hotel and plenty of water. 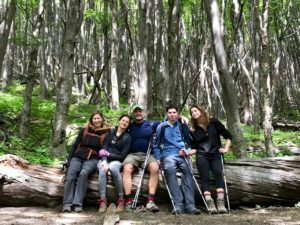 We grabbed hiking poles, useful for all on the descent and especially for my husband who was only three months post-knee replacement—and off we went. A frequent phrase spoken in Patagonia is “four seasons in one day,” and it couldn’t be more apt. Our hike began with a long, steep incline and an hour later we were on a flatter, windy trail putting on an extra layer. A forested area gave us some protection from the cooler air, and then as we hiked up the moraine, scrambling through boulders and rocks, we got hot again. Once at the top, we broke out our parkas, hats and gloves—very needed despite a clear blue sky. We ate our picnic lunch and sipped some mate, protected from the wind by a giant boulder, taking in the beauty of the turquoise, glacier-fed lake beneath the towers and the encircling snow-capped mountains. The following morning, the boys relaxed at the indoor pool, while my daughters, Nicole and Emily, and I went with Nacho to do some horseback riding at a nearby ranch, Estancia Lazo. Once settled on our horses, we followed the gaucho, Carlos, who led us through a forest and up a mountain range for more beautiful views. Not the chattiest guy, Carlos occasionally peered back at us and we learned that was a signal to start cantering through the woods. We crossed shallow streams on horseback, and came across a pack of the ranch’s horses roaming freely in the forest. 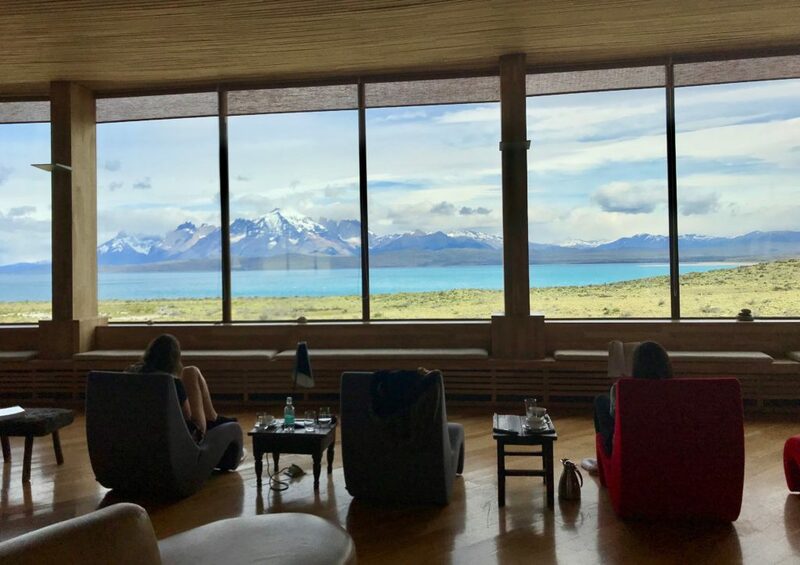 It was hard to leave the coziness of Tierra Patagonia, with its inviting “living room” that stretched into the bar and restaurant, all with expansive views of Torres del Paine in the distance. After our four-hour drive back to Punta Arenas, we flew to Santiago, the capital of Chile, where we spent one night before traveling to our next destination. In a lively area just a couple of blocks from our hotel, The Singular, we ate dinner at Bocanáriz, a wine bar where we drank flights of local wine and ate small plates. Refilling a water bottle in a glacier-fed stream. alcohol (Pisco Sour anyone?) are included in the rate, making for a relaxed vibe with little to worry about other than what hiking route to take and which dessert to choose. San Pedro is at just over 8,000 feet above sea level, so it’s important to acclimate before taking on the higher, tougher trails in the Atacama desert—a high-altitude desert and the driest in the world. 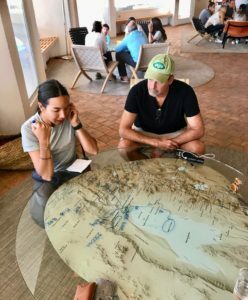 Upon our arrival, we were welcomed by a guide, Alice, who gave us a brief slide presentation about the region, the climate, the altitude, and all of the excursion options available. We then sat in front of a map, and planned our activities for the next four days. Our first afternoon outing was a hike along the ledge of a salt mountain range, from where we descended into the Mars valley, running and sliding down steep, reddish sand dunes in our bare feet. At the end of the two-and-a-half hour hike, we reached our waiting van and a picnic table set up with appetizers, fruit, and drinks. We were acclimating just beautifully. The next day’s hike led us through a cactus valley on a trail that follows a river as it weaves through a canyon. Crossing the river a half dozen times (full disclosure: I may have been the first one with wet feet), we scrambled down the edge of some waterfalls, eventually making our way out of the canyon. Mapping out our activities with our guide, Alice. Because of Atacama’s high altitude, very little rainfall, and clear skies, the region offers a nightly stargazing spectacle. A stay at Explora includes an assigned nighttime astronomy viewing in the hotel’s observation dome, which houses a large, advanced optics telescope. Our assigned night was not the best for viewing, yet through the telescope we were able to see the surface and craters on the moon which was nearly full, as well as a nebula—a cloud of dust where stars are born—under Orion’s sword. 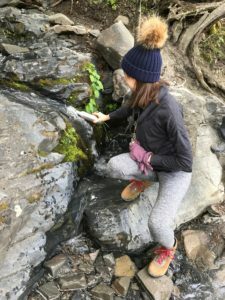 Our next days’ three-hour hike descended through a ravine into an upward trail that leads to the Puritama hot springs, where we spent time soaking up the minerals and savoring the scenery—a well-earned treat for our tired bodies. Reveling in the beauty of the Mars valley. Later that afternoon, we took a one-hour drive to visit the salt flats in a national reserve, where we stopped at the Chaxa lagoon to see a flock of flamingos and stay for a beautiful, desert sunset. Into the Moon valley we went for our final hike. After walking along the Kari ravine, we descended into the canyon, formed by water erosion and is surrounded by giant sedimentary walls of clay, gypsum and salt. 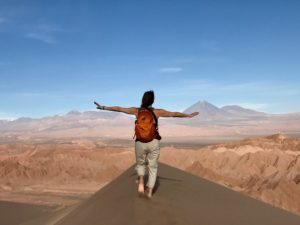 Our excursions in Atacama all felt otherworldly, with their mix of topography and geology—the stony terrain, salt lakes, sand dunes, and lava rocks. The girls and I took some time that afternoon to explore the village of San Pedro, a 15-minute walk from Explora. Bars, restaurants and shops selling outdoor clothing line the pedestrian-only main street. We weaved our way to the town’s church and main square, walking through an alley that houses the local handicraft market where we picked up a few souvenirs. The five of us spent our last morning on horseback—a final equine stroll into the canyon of the salt mountain ridge—before heading back to the realities of daily life. My experiment was over. Nine days of family-filled adventure in soul-nourishing nature. I smiled more then I had in a long time, even when alone. I felt physically energetic and “alive” in a way that lifted me emotionally. There were some intense conversations and, naturally, some irritating moments. We were also, at times, pretty tired and sore. But we were together, surrounded by stunning natural beauty. My study was a success.